Interact with the creatures of ARK: Survival Evolved. ARK Park, the multiplayer virtual reality adventure game based on ARK: Survival Evolved, will launch for PlayStation VR, HTC Vive, and Oculus Rift on March 22, publisher and developer Snail Games announced. The game will be available in standard and deluxe editions. The latter includes extra outfits, as well as an exclusive dinosaur mount. ARK Park allows HTC Vive, PlayStation VR, and Oculus Rift users to interact with the majestic creatures last seen in the popular action-adventure survival game ARK: Survival Evolved – fulfilling the dream of meeting living, breathing dinosaurs “face-to-face” through a series of exquisite VR-powered theme-park attractions. Voice-overs and subtitles will be in English, Japanese, Korean, and Chinese (Traditional and Simplified). Exploration – Tour distinctive primal environments solo or with a group of friends. These excursions can be relaxing and challenging at the same time. Step into the tropical rainforests, snow-covered mountains, and expansive plains – along with the dinosaurs that call these habitats home! Gene Collecting – Visitors may collect “Gene Cubes” from the many extinct creatures during excursions. However, collecting all of them can be challenging due to the reclusive habits of particular species. Determined visitors will need to use a combination of puzzle-solving, exploration, and careful resource management to bag the most prized animals. The gene cubes are necessary for unlocking blueprints, which can be used to craft tools, lures, items and weapons. 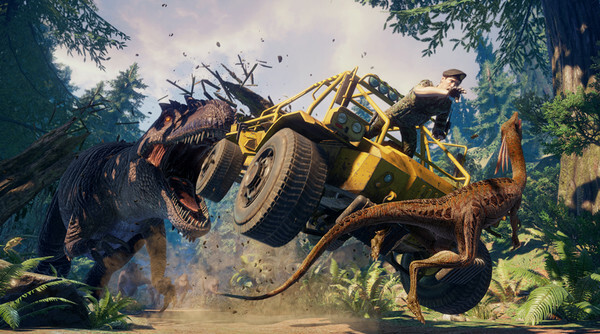 Combat – In Story Mode, something goes wrong with the park’s Brainwave Device – resulting in herds of rampaging dinosaurs everywhere. You and your friends must defend the base (and other humans) with custom-made weaponry – including a selection of melee and ranged weapons, along with other highly-effective combat items. Swords, spears, pistols, scatterguns, and grenades will be available at launch. Multiplayer Gameplay – Excursions are much easier to complete when players can brainstorm and search for secrets together. More difficult Hunting Maps require close collaboration and teamwork for best results!